“Is Joke here?” she called out, referring to her project manager — a Dutch architect named Johanna Post — by her nickname (pronounced yo-ka). Post had stepped out, but another colleague informed Gins that she would return before their next meeting. Gins exhaled and nodded. She and the small staff of architects who work in her office, called the Reversible Destiny Foundation, had been in a state of heightened urgency for months. They were rushing to complete a new project, commissioned by the high-fashion store Dover Street Market, which would soon open a location in a Beaux-Arts building in Manhattan’s East 30s. The facade would remain unchanged, but the interior would become a mish-mash, combining the work of a number of different artists and architects. Gins would build a large covered stairway connecting the building’s open-plan third floor to the mezzanine above. But Dover Street had given Gins far less space to work with than she initially thought she would have; her team was scrambling to make sure the project would both live up to her standards and be able to fit. Gins, in her early seventies, gave the impression of a child trying to impersonate her grandmother: her blonde hair was fastened in pigtails, and her small frame was draped in too-big clothes in shades of deep red. Her face was clear-eyed and rosy, even as wrinkles rippled across her cheeks. She exhaled again. “You know, I have huge responsibilities,” she continued. “Pressing ones.” Most architects generally want to design comfortable, visually interesting buildings for their clients. Gins found that aspiration boring. Instead, her goal was to build spaces that would keep people from dying. According to Gins’s elaborate theory of Reversible Destiny, developed over the course of a forty-five-year collaboration with her husband and artistic partner, Shusaku Arakawa, death may not in fact be inevitable. People are lulled into believing it is because they focus only on what has come before — the “thus-far obligatory downhill course of life,” according to Gins. 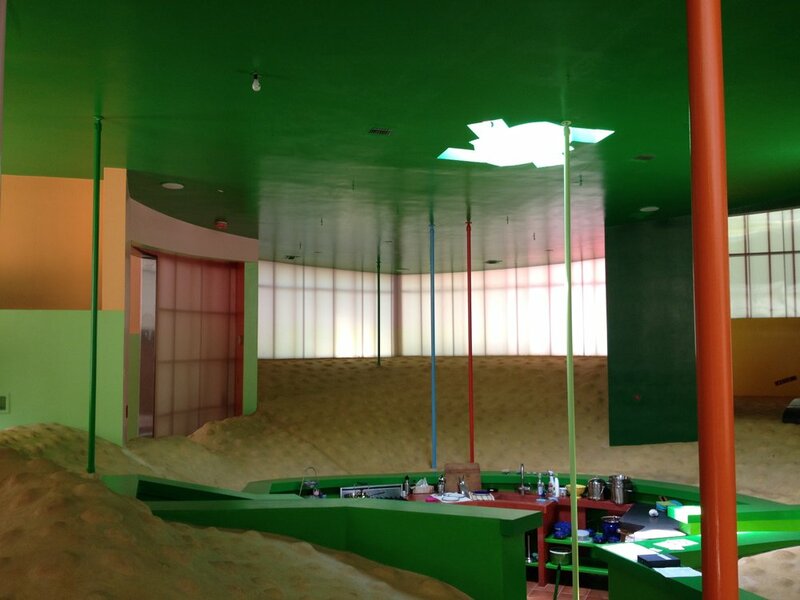 Their brightly colored, disorienting dreamworlds, which look more like surrealist playgrounds than traditional buildings, are intended to jolt people out of their normal routines and force them to move through life differently. If people are unable to fall back on their physical and mental habits, Gins and Arakawa said, they will be open to new ideas, including the possibility that they can lengthen their lives and, eventually, resist death entirely. Avant-garde architecture is expensive, though, and many of Gins and Arakawa’s ideas, including the Healing Fun House, remain on paper. Prior to the Dover Street commission, only one Reversible Destiny project — a private home in East Hampton, New York — had been built in the US. (Several have been constructed in Japan, however, including a number of wonky apartments that house short- and long-term tenants.) Dover Street Market provided a chance to bring Gins’s work to many people who otherwise wouldn’t encounter it. But the store was scheduled to open in December, and Gins’s structure was not finalized. She insisted she was finding the rush creatively invigorating. “I think the universe might be against Reversible Destiny for a little while longer, but it’s changing,” she said. That December, before the project was scheduled to open, I began to have problems reaching Gins. She postponed meetings, saying she hadn’t been sleeping. She would reschedule them, she promised — always in a couple days, when, she said, she would be feeling better. For a few weeks, the only way to communicate with her was over the phone. I eventually learned from a friend of Gins’s that in the early aughts, she had been diagnosed with breast cancer. The disease had long been under control, but Gins’s health had recently taken a turn. She had been determined to use the Dover Street commission to push the boundaries of Reversible Destiny, conducting new research that she thought might help keep her alive. Throughout early January, I continued to try to contact Gins, now with no response at all. One bright, freezing afternoon, while crossing the Manhattan Bridge, an email arrived. Inside was a notice of Madeline Gins’s death, that morning, from metastatic cancer.